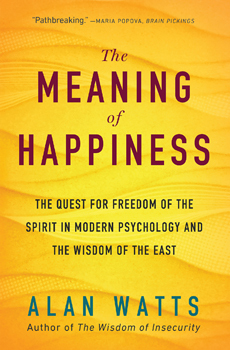 Most books about happiness sell the idea that happiness comes from having or doing something. In this bold and iconoclastic work, however, philosopher Alan Watts offers a more challenging thesis: authentic happiness comes from embracing life as a whole in all its contradictions and paradoxes, an attitude that Watts calls the "way of acceptance." Drawing on eastern philosophy, western mysticism, and analytic psychology, Watts demonstrates that happiness comes from accepting both the outer world around us and the inner world inside us - the unconscious mind, with its irrational desires lurking beyond the awareness of the ego. Although written early in his career,The Meaning of Happiness displays the hallmarks of his mature style: the crystal-clear writing, the homespun analogies, the dry wit, and the breadth of knowledge that made Alan Watts one of the most influential philosophers of his generation.